The single most important dishwasher tip for getting cleaner dishes from your dishwasher is use HOT WATER! According to dishwasher manufacturers, the number one complaint from home owners about their dishwashers is not getting the dishes clean enough, due to the water not being hot enough to completely dissolve the detergent. The water must be at least 130 degrees F for dishwashers to work effectively. This is documented by the major manufacturers of dishwasher detergents, such as Proctor & Gamble. Speed up your hot water! Save thousands of gallons of water per year! 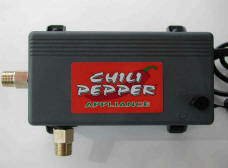 The Chilipepper is a small, powerful, micro-processor controlled pump that mounts under your sink. At the touch of a button your hot water is pumped rapidly to your sink or shower. No water gets run down the drain, saving you thousands of gallons of water per year! It works with any kind of water heater including tankless and solar water heaters. In many cases your Chilipepper will provide you with quick hot water at several or even all of the sinks and other fixtures in your home. Remote control operation from any room is easy with the remote control option. The Chilipepper consumes less than $2.00 worth of electricity per year to operate. If for any reason you are not satisfied within the first 30 days, return your Chilipepper for a complete refund! No questions asked. Cleaner dishes, less waiting for hot water, saving water and money are all good reasons to install a Chilipepper hot water pump today!